CAMP HILL, Pa. — In another sign of its financial turnaround, Rite Aid Corp. has opened its first newly built store since 2010. Rite Aid on Tuesday held a ribbon-cutting ceremony for the new 14,500-square-foot store, located at 4999 Jonestown Rd. in Harrisburg, Pa., not far from the company’s headquarters in Camp Hill, Pa.
U.S. Rep. Lou Barletta (R., Pa.) joined Rite Aid chairman and chief executive officer John Standley and president and chief operating officer Ken Martindale for the grand opening event at the store, which features the drug chain’s innovative Wellness Store format. As in Rite Aid’s other Wellness Store locations, customers entering the new Harrisburg store see a wooden path that leads to the pharmacy department. Pharmacists in the Wellness Stores have special training in diabetes care and medication management and are certified to immunize for about a dozen diseases, including flu, pneumonia, shingles and whooping cough. 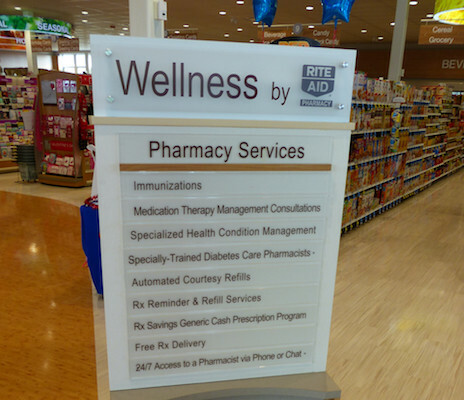 Another key feature of the format is the Wellness Ambassador, a special service associate who works closely with the pharmacists to provide customers with access to information on over-the-counter medications, vitamins and supplements, and Rite Aid programs and services. Other key design features in the Harrisburg store include overhead departmental rings designating each section of the store, such as beauty, food, home care and seasonal; a warm color palette with wood tones and soft lighting; hundreds of new health and wellness products, including organic and gluten-free foods; a specially designed GNC vitamin department, including an interactive kiosk that helps customers make informed purchasing decisions. The store also has multiple drive-through pharmacy lanes and a consultation room adjacent to the pharmacy, where Rite Aid pharmacists can have conversations with patients, administer immunizations and offer other clinical pharmacy services. Rite Aid now has more than 1,500 Wellness Stores since debuting the format in the spring of 2011. Company executives have said they were targeting 450 Wellness remodels by the close of the 2015 fiscal year at the end of February. As of Feb. 28,, Rite Aid had 4,570 stores overall. Standley has previously said that as Rite Aid moves ahead with the Wellness remodels and store relocations, it will gradually approach a phase of being able to open brand-new stores.